Securing a mortgage in a normal housing market can be long and complicated, and the process has become even more arduous in the current environment. With tight lending practices and low inventory levels, potential buyers are facing significant hurdles. What's more, first-time buyers, usually of the Millennial generation, have the added pressure of a weak job market and massive student loan debt that limits their purchasing power. "[Owning a home] is really about deferred gratification," says Michael Corbett, Trulia's real estate expert. "You know where the market's going -- you need money, a job history, and you need to show your debt is low compared to your income." Before Millennials start the home-buying process, experts suggest coming up with a financial plan and meeting with a mortgage professional. While everyone has a different financial situation, a professional can create a strategy for buying that first home. Saving for a down payment, overcoming a disproportionate amount of debt versus income and understanding a particular market is difficult -- but not impossible, says Andre Brooks, regional sales manager at Wells Fargo Home Mortgage. "There are pockets where people have become successful; it's a matter of being educated and informed about your market and the finances to buy a home." Is this the right time to buy a home? The cost of owning a home is a lot more than just the monthly mortgage payments. Buyers need to be prepared to cover costs like maintenance, decor and insurance. 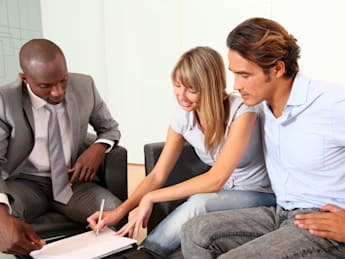 "Just because you can get a loan does not mean it's the best thing," says Karen Goodfriend, certified public accountant and principal at KK Wealth Advisors. Buying a home can be very emotional, but sometimes it's best to wait until things are better positioned in life. "What's really important to you and what things are you really willing to do to save?" she asks. Where do you want to buy? "The key is, if I know and understand the real estate market I'm buying in, if I know the options to accumulate money, then I can figure out a game plan," says Brooks. "This game plan may extend over six, 12 or 36 months." The amount of time that a buyer plans to spend in the new home is important when it comes to recovering closing and moving costs -- which can take up to seven years. For a buyer not planning to stay that long, Brooks suggests buying in a marketplace that's experiencing a sustained price increase to have the best chance of breaking even. What can you afford? Lenders need to see sellers can afford the mortgage -- long gone are the days of unverified loans. "Speak to a mortgage professional to find out what it will take to qualify for a loan," says Goodfriend. Before looking for a home, experts suggest getting prequalified to set price limits. Along with income, lenders also take into account a borrower's debt-to-income ratio, known as a DTI, and any credit card and student loan debt can raise this ratio. "Your DTI will tell you what kind of house you can afford -- a massive student loan will eat into your income," says Corbett. While quickly eliminating student debt is a big hill to climb, Frank Donnelly, chairman of the board of the Mortgage Bankers Association of Metropolitan Washington, advises consolidating these loans to lower your monthly payments and DTI ratio. "It all starts with a budget and having good discipline," says Goodfriend. "Living within one's means and not having credit card balances will help someone afford a loan and get a loan." Paying off student loans will really help you qualify for a mortgage but this requires a plan to pay off debts and layering in everything else that will help you get a mortgage. Do you have good credit? Before applying for a mortgage, experts suggest consumers review their credit history and address any issues. "Know what you need to do to build credit if you don't have a lot of it," says Cara Ameer, broker associate and Realtor at Coldwell Banker Vanguard Realty based in Ponte Vedra Beach, Fla. Good credit not only helps get qualified for a mortgage but it also helps keep the interest rate on the mortgage low. "Think about your credit score as an asset," says Goodfriend. "You want to be in the best position possible to get a mortgage." Paying credit cards late or carrying a high balance can make getting a mortgage difficult. "Be disciplined about spending and paying credit cards on time," she adds. Some young buyers who haven't established a strong credit history might need some help. "Without good or enough credit, you may need a cosigner on the loan," says Ameer. Have you saved enough for a down payment? "If buying a home is a goal, it may take years to be able to save for a down payment but have a strategy and work towards it," says Goodfriend. Although everyone's income will likely increase over time, experts suggest putting 20 percent down on a new home. "Just because the bank will loan it to you doesn't mean you should take the loan," says Corbett. "If you aim for the 20 percent down, the worst you can have is money in the bank." "Research the different loan programs that are geared towards a first-time buyer," says Ameer. Some assistance programs can help with the down payment and closing costs but these loans might be more expensive. New York is the biggest and most walkable city in the U.S. This row of charming brownstones in Cobble Hill is steps from Brooklyn Bridge Park and a top-rated elementary school. It’s also an ideal location for bus riders with 13 nearby routes, and cyclists will feel at home with excellent bike lanes on flat terrain. This two-story, historic loft conversion has enough appeal on its own, but it’s also in a prime location near the Financial District, AT&T Park, the San Francisco Museum of Modern Art and the waterfront. With a Transit Score of 100, the home is near 94 bus routes and 14 rail routes. A completely renovated, single-family home is available near public transit in Charlestown. Restaurants, bars and coffee shops are all less than a half mile away, making this a very walkable location. This Irving Park condo offers modern conveniences inside and out. You can grab a drink at Fuller’s Pub 0.2 miles away and then cook up a meal back at home with top-of-the-line, stainless steel appliances. Parks, shopping and schools are also in close proximity, making it possible to run most errands without a car. A two-bedroom, 1.5-bath restored carriage house is available just off Passyunk Avenue, the main destination for bars, restaurants and entertainment in South Philly. For Center City commuters, this home is near 14 bus routes and a rail route.